Posted by OromianEconomist in Famine in Ethiopia, Uncategorized. The Famine Early Warning Systems Network says some families in southeastern Ethiopia face a potential ‘catastrophe’ after large-scale livestock die-offs in the past year. The USAID-funded watchdog writes in its latest November update that some populations of Ethiopia are forecasted to reach levels 4 to 5 on the five-point scale used to measure food security and famine. “A major food security emergency is expected to continue in southeastern Ethiopia into mid-2018. Worst-affected areas include Dollo, Korahe, and Jarar zones, along with parts of Afder and Liben, which will be in Emergency (IPC Phase 4) through May 2018, while some households will be in Catastrophe (IPC Phase 5),” the watchdog group says. FEWS NET works with agricultural, market, and weather data to forecast gaps that could lead to widespread hunger or famine. Recently, southeast Ethiopia’s ongoing Deyr/Hagaya season (which runs from October to December) has performed better than other recent seasons. However, the report questions whether this improvement is enough to keep pastoral and agropastoral families in the region from falling into hunger. “Substantial time and favorable performance in upcoming seasons is needed for households to reconstitute livestock herds and recover their key livelihood activities, following very high excess livestock deaths and sales due to drought in 2016/17,” reads the report. Food security is also expected to be ‘stressed’ in parts of the Southern Nations Region from February to June next year, due to poor harvests this year, but humanitarian needs there will not be as bad as the Somali region. The severe food insecurity in southeastern Ethiopia is similar to that experienced in neighboring Somalia, which has been suffering from a bad drought as well as an ongoing civil war. Click here to read related article, from Orromian Economist source: Oxfam: Hungry in a world of plenty: millions on the brink of famine: In Ethiopia alone, 700,000 people are on the verge of starvation. It is estimated that 8.5 million people are hungry in the country. 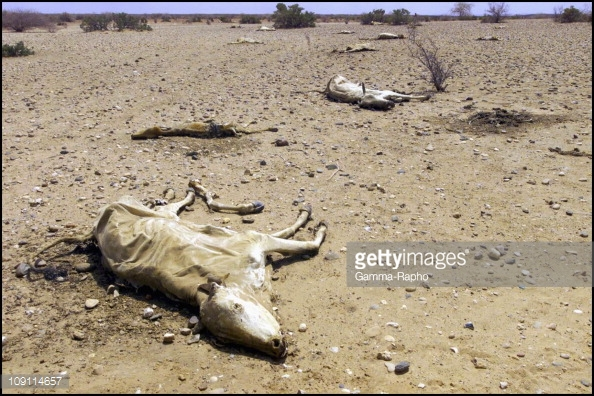 Tags: 'Death Awaits': Africa Faces Worst Drought in Half a Century, Africa, catatrphic famine, Drought, Ethiopia, Famine, Famine and Ethiopia rising meme, Why Famine is a Permanent Phenomenon in Ethiopia? FILE – People wait for food and water in the Warder district in the Somali region of Ethiopia, Jan. 28, 2017. On Thursday, the Ethiopian government increased its count of the number of people requiring emergency food aid from 5.6 million to 7.7 million, a move that aid agencies say was long overdue. The figure is expected to rise further as southeast Ethiopia confronts another fierce drought. But with food crises erupting across the continent and the government’s budget strained by last year’s drought, the money isn’t there to fight it. There could eventually be as many people in Ethiopia needing emergency food assistance as in Somalia and South Sudan combined. There have also been accusations that the government is playing down the severity of the crisis to keep the country from looking bad internationally. During the earlier drought, it was months before the government admitted there was a problem, in part because Ethiopia had gained a reputation as Africa’s rising star and didn’t want to go back to being associated with drought and famine. The contrast is clear in the bustling capital, Addis Ababa, where rainy skies and a hive of construction projects make it feel thousands of miles away from any drought. While Pizza Hut restaurants are set to soon open in the capital, thousands of children in the arid southeast suffer from acute malnutrition, and cholera is ripping through the relief camps. Ethiopia is facing a killer drought. But it’s going almost unnoticed. ADDIS ABABA, Ethiopia — The announcement by the United Nations in March that 20 million people in four countries were teetering on the edge of famine stunned the world and rammed home the breadth of the humanitarian crisis faced by so many in 2017. Yet even as donors struggle to meet the severe needs in the war-torn nations of Nigeria, South Sudan, Somalia and Yemen, another crisis, more environmental in nature, is taking place nearby — nearly unnoticed. Ethiopia, long associated with a devastating famine in the 1980s, returned to the headlines last year when it was hit by severe drought in the highland region, affecting 10.2 million people. Food aid poured in, the government spent hundreds of millions of its own money, and famine was averted. Now it’s the turn of the lowland region, particularly the area bordering Somalia, where a drought brought on by warming temperatures in the Indian Ocean has ravaged the flocks of the herders in the region and left people without food. With their sheep and goats mostly dead, the nomads are clustered in camps surviving on aid from the government and international agencies — but that food is about to run out. With donors focused on Somalia across the border, little international aid has found its way to the Ethiopian areas hit by that drought. “I think it’s partly because there are other priorities, and they are not signaling loudly enough to donor offices,” Mason said. According to a document detailing Ethiopian’s humanitarian needs that was drawn up in January by the government and aid agencies, Ethiopia needs nearly $1 billion to confront the crisis, more than half of which it still lacks. That figure also does not take into account the revised estimates in the numbers of people requiring aid. During last year’s drought, Ethiopia came up with more than $400 million of its own money to fight off famine, but this year, it has been able to commit only $47 million, probably because of an exhausted budget. The United Nations World Food Program (WFP), which is working in Ethiopia’s drought-hit Somali region, has started cutting its food rations to 80 percent. It is short $121 million for its Ethiopia operation this year, and the money is expected to run out over the summer. If no new money arrives, the rations could be cut to 420 calories for the whole day — the equivalent of a burger. The government’s food contribution will probably suffer a similar fate. There is also the fact that the Horn of Africa has been incredibly unlucky these past few years in terms of weather. Though famine was averted, many parts of the Ethiopian highlands are still recovering from the 2015-2016 drought, which was attributed to the El Niño ocean-warming phenomenon in the Pacific. The U.N. World Meteorological Organization said Friday that there is a 50 percent to 60 percent chance that the Pacific will see another strong warming trend this year, which means Ethiopia’s highlands will be slammed again at a time when world resources are scarcer than ever. Even while they have one of the smallest carbon footprints on the globe, herders’ fragile existence in the arid climate of the Horn of Africa is probably the most threatened by climate change. Adding to aid organizations’ concerns is a proposal by the Trump administration to slash U.S. contributions to international aid institutions, including the WFP. The U.S. government is the largest donor to the program. The proposed cuts, part of the president’s 2018 budget blueprint, are likely to face stiff opposition in Congress. Paul Schemm is the Post’s overnight foreign editor based in Addis Ababa, Ethiopia, joining the paper in 2016. He previously worked for the Associated Press as North Africa chief correspondent based in Morocco and prior to that in Cairo as part of the Middle East regional bureau. Dead camels rot on the outskirts of informal settlements in Ethiopia’s rain-starved Somali region as their owners, once proudly self-sufficient pastoralists, turn to government aid to stay alive. Ethiopia is facing a drought so terrible that nomadic herders, the hardiest of survivors, have been pushed to the brink. The lucky ones receive supplies of food and brackish water, but the majority, who have settled in spontaneous camps in the remotest reaches, must look after themselves. 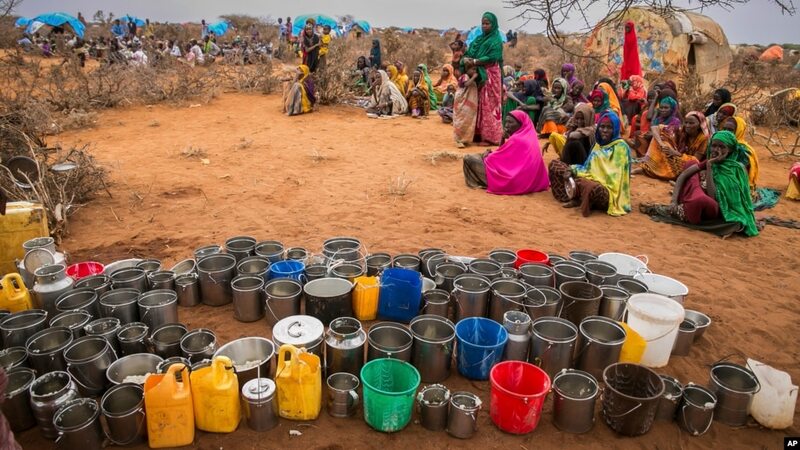 Across the Horn of Africa, people are struggling after three successive years of failed rains. In Somalia and Yemen, there is real fear of famine. While Ethiopia’s remote southern region has been spared the warfare that has deepened the crisis confronting its neighbours, the drought has been no less brutal. “Having lost most of their livestock, they have also spent out the money they had in reserve to try to keep their last few animals alive,” said Charlie Mason, humanitarian director at Save the Children. Livestock are the backbone of the region’s economy. Pastoralists here are estimated to have lost in excess of $200 million-worth of cattle, sheep, goats, and camels. That is not only a blow to their wealth, but also deprives them of the meat and milk that is the mainstay of the pastoralist life-support system. Last year, more than 10 million people were affected by an El Niño-induced drought. The government spent an unprecedented $700 million, while the international community made up the rest of the $1.8 billion needed to meet their needs. This year, the appeal is for $948 million to help 5.6 million drought-affected people, mainly in the southern and eastern parts of the country. So far, only $23.7 million has been received. The government has a well-established safety net programme managed by the World Bank that supports the chronically food insecure, typically with cash-for-work projects. But it doesn’t pick up those affected by sudden shocks like the current drought. They fall under a new and separate programme, which is struggling to register all those in need. There are 58 settlements for the internally displaced in the Somali region currently receiving government aid. But that’s only a fraction of the 222 sites containing nearly 400,000 displaced people identified in a survey by the International Organization for Migration. Forty-four percent of these camps reported no access to food, and only 31 percent had a water source within a 20-minute walk. “People were surviving from what they could forage to eat or sell but now there is nothing left,” said one senior aid worker who visited a settlement 70 kilometres east of the southern town of Dolo Ado, where 650 displaced pastoralist families weren’t receiving any aid at all. The only livestock left alive in the camp was one skinny cow, its rib cage undulating through its skin, and her new-born calf. In some shelters people were reported as too weak to move. Informal settlements have sprung up wherever the exhausted pastoralists have stopped. The further away from the regional capital, Jijiga, the less likely they are to be supplied by the government. There is also a degree of friction between the federal government and the semi-autonomous regional authority. “There’s a logical reason to limiting the number of temporary assistance sites – because otherwise getting assistance to people scattered over such a large area becomes a massive challenge,” said Mason. But given the security restrictions on travel in the Somali region, and the well-known nervousness aid agencies have over antagonising the government, it is very hard to gauge how many people may have fallen through the cracks and are not receiving assistance. The Ethiopian government is far more open over the refugees it helps. It has maintained an open-door policy and currently shelters an estimated 800,000. Just outside Dolo Ado, where the Ethiopian border intersects with Kenya and Somalia, are two enormous camps. With rows of corrugated iron roofs glinting in the sun, each houses about 40,000 Somalis escaping their own food crisis and ongoing conflict. Refugees complain of headaches and itchy skin due to the pervading heat of 38 – 42 degrees Celsius, and of a recent reduction in their monthly allowance of cereals and grains from 16 to 13.5 kilograms. However, they are guaranteed that ration, along with water, health and education services – none of which is available to IDPs in a settlement on the outskirts of Dolo Ado. Abiyu spoke amid a cluster of women, children, and a few old men beside makeshift domed shelters fashioned out of sticks and fabric. Husbands were away either trying to source money from relatives, looking for daily labour in the town, or making charcoal for family use and to sell. In the Somali region’s northern Siti zone, IDP camps from droughts in 2015 and 2016 are still full. It takes between seven and 10 years for pastoralists to rebuild flocks and herds after losses of more than 40 percent, according to research by the International Livestock Research Institute and the UN’s Food and Agriculture Organization. And Ethiopia’s crisis is far from over. The main spring Gu/Ganna rains have finally begun in parts of the Somali region, but they were a month late. The forecast is that they will be below average and won’t regenerate pasture sufficiently for the pastoralists, who have lost so much, to rebuild their lives. 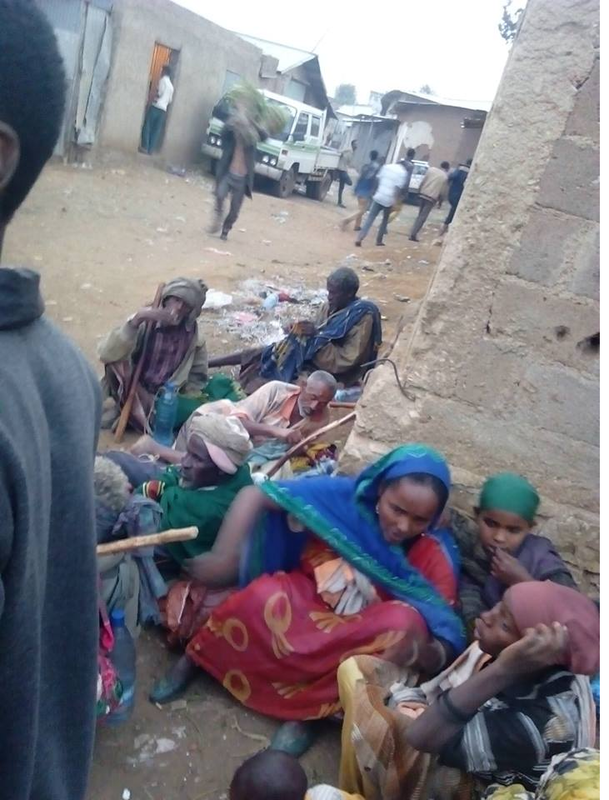 Posted by OromianEconomist in Famine in Ethiopia, The study of Evil, The Tyranny of TPLF Ethiopia. Fred de Sam Lazaro is director of the Under-Told Stories Project at the University of St. Thomas in Minnesota, a program that combines international journalism and teaching. He has served with the PBS NewsHour since 1985 and is a regular contributor and substitute anchor for PBS’ Religion and Ethics Newsweekly. Posted by OromianEconomist in Famine in Ethiopia, Food Production, Free development vs authoritarian model, Illicit financial outflows from Ethiopia, Land Grabs in Africa. (Unicef, News24, October 22, 2015): The number of hungry Ethiopians needing food aid has risen sharply due to poor rains and the El Nino weather phenomenon with around 7.5 million people now in need, aid officials said on Friday. That number has nearly doubled since August, when the United Nations said 4.5 million were in need – with the UN now warning that without action some “15 million people will require food assistance” next year, more than inside war-torn Syria. “Without a robust response supported by the international community, there is a high probability of a significant food insecurity and nutrition disaster,” the UN Office for the Coordination of Humanitarian Affairs, OCHA, said in a report. The UN children’s agency, Unicef, warns over 300 000 children are severely malnourished. The Famine Early Warning Systems Network (FEWS NET), which makes detailed technical assessments of hunger, predicted a harvest “well below average” in its latest report. Ethiopia, Africa’s second most populous nation, borders the Horn of Africa nation of Somalia, where some 855 000 people face need “life-saving assistance”, according to the UN, warning that 2.3 million more people there are “highly vulnerable”. El Nino comes with a warming in sea surface temperatures in the equatorial Pacific, and can cause unusually heavy rains in some parts of the world and drought elsewhere. Hardest-hit areas are Ethiopia’s eastern Afar and southern Somali regions, while water supplies are also unusually low in central and eastern Oromo region. Food insecurity is a sensitive issue in Ethiopia, hit by famine in 1984-85 after extreme drought. Today, Ethiopia’s government would rather its reputation was its near-double-digit economic growth and huge infrastructure investment – making the country one of Africa’s top-performing economies and a magnet for foreign investment. Still, nearly 20 million Ethiopians live below the $1.25 poverty line set by the World Bank, with the poorest some of the most vulnerable to weather challenges. Ethiopia’s government has mobilised $33m in emergency aid, but the UN says it needs $237m. Minster for Information Redwan Hussein told reporters at a recent press conference that Ethiopia is doing what it can. “The support from donor agencies has not yet arrived in time to let us cope with the increasing number of the needy population,” he said. Jiraattonni aanaaAdaamii Tulluu , gargaarsa dhabanii beelaan miidhamaa jiru. OMN:Oduu Onk. 21,2015 Beelli godinaalee Oromiyaa hedduu miidhaa jiru, gara godina Shawaa bahaa aanaa Adaamii Tulluu Jidduu Kombolachaa jedhamutti, babaldhatee akka jiru himame. Jiraattonni aanaa kanaa, gargaarsa dhabanii beelaan miidhamaa jiraachuu isaanii dubbatan. Beelli Oromiyaa godinaalee adda addaa keessatti bara kana namootaa fi loon miidhaa jiru, ammas kan hin dhaabbanne ta’uun himamaa jira. Haaluma kanaan gara godina Shawaa Bahaa aanaa Adaamii Tulluu Jidduu Kombolchaatti babaldhatee akka jirullee jiraattonni dubbatan. Jiraataan aanichaa tokko OMN f akka himanitti, rooba dhabameen wal qabatee, hoongee uumameen, namoonni hedduun araddaalee gara garaa keessa jiraatan, beelaaf saaxialamanii jiru. Bara kana keessa bokkaan si’a lama qofa reebe kan jedhan namni kun, sababa kanaan namoonni midhaan facafachuu qaban, nyaataaf oolfataniiru. Kan hafe ammoo kafaltii xaa’oo akka baasaniif wayta mootummaan dirqisiiseetti, midhaan facafachuuf qopheeffatan gurguranii baasiif kennanii jiru. Namoonni hedduun qabeenya harkaa qaban waan fixataniif, beelaaf saaxilamuu danda’aniiru jedhan. Akka namni kun jedhanitti, namoonni hedduun baadiyaa keessa jiraatan, beela sukaneessaa isaan miidhaa jiru jalaa, qe’ee isaanii dhiisanii gara magaalatti deemaa jiru. Namoota gara magaalatti deemaa jiran keessaa manguddoonni humna dhabeeyyi ta’anis ni jiru. Erga magaalaa gahanii booda, lubbuu ufii jiraachisuuf jecha, hujii humnaa olii hojjatanii jiraachuudhaaf dirqamanii jiran. Hujii humnaa kana hojjachuudhaaf kan dirqaman, lubbuu ufii du’a irraa hambisuuf kan jedhan namni kun, beelli bara kana aanaa isaanii muudatee jiru, haalan yaddessaa ta’uu dubbatan. Namoota beela kanaan miidhamanii asii fi achi deemaa jiran kana, gama mootummaa biyya bulchaa jiruun, haga ammaatti birmannaan taasifameef tokkollee akka hin jirre namni kun dubbatan. Namoonnii baay’een daa’imman isaanii waan nyaachisan dhabanii rakkataa jiru. Loon ammoo marga dheedan dhabuun du’aaf saaxilamaniiru jedhan. Rakkoo kanaan dura muldhatee hin beekne kana, mootummaanis gargaaruu dhiisee caldhisee ilaalaa jira kan jedhan namni kun, sababa kanaaf haalli ammaan kana jiru garmalee yaaddessaadha. Mootummaan humanan taaytaa qabatee jiru, diinaggeen biyyattii dijiitii lamaan guddatee jira jechuun wayta faarsaa jiru kanatti, lammiileen biyyattii hedduun beelaan saaxilamuu isaanii midiyaalee gara garaa gabaasaa jiraachuun ni yaadatama. Drought, food crisis and Famine in Ethiopia 2015: Children and adults are dying of lack of food, water and malnutrition. Animals are perishing of persisting drought. 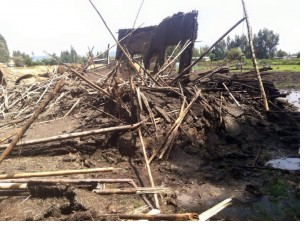 The worst Affected areas are: Eastern and Southern Oromia, Afar, Ogaden and Southern nations. The tale of two countries (Obama’s/TPLF’s Ethiopia and Real Ethiopia): The Oromo (Children, Women and elders) are dying of genocidal mass killings and politically caused famine, but Obama has been told only rosy stories and shown rosy pictures. 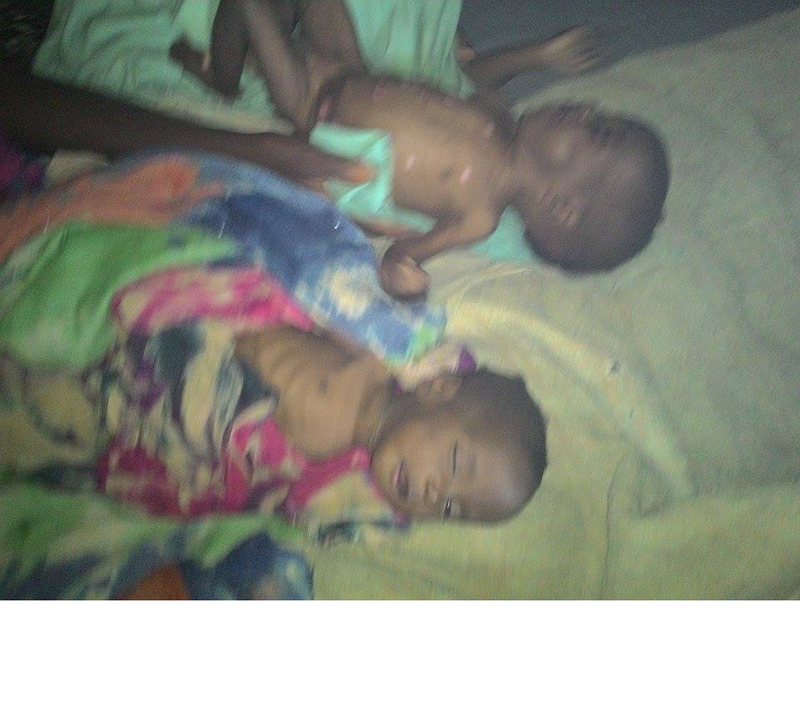 Why Famine is a Permanent Phenomenon in Ethiopia? A recorded history shows that there was famine during the reign of Minilik. This famine was attributed to a plague called “ye Hidar Beshita” as their chroniclers put it. The story goes like this, “this plague killed people and their domestic animals like cows and oxen that caused a wide spread catastrophe and famine throughout the newly incorporated regions of the empire. The true story which the chroniclers did not want to mention was the plague broke out due to genocide committed in Oromia and the southern regions by Minilik army. Somehow the plague killed millions of people and farm animals. Since the farm animals were extinct there were no means left to plow the land to grow crops. The chroniclers of the king’s history told us that the king ordered the skilled people to produce pickaxes to be distributed to the people to dig the land by hand in which the king himself participated in digging to prepare the land for growing crops. That was a “big technological innovation” discovered by Minilk to mitigate famine according to them. This was narrated by his admirers to present Minilik as the innovative king who had concern for his people. For a shallow minded people it looks true. But Minilik who was an expert in amassing war technology like gun and ammunition from European countries to kill several millions of Oromos and the Southern Peoples had no sympathy to ask for medicine, food and farm technology aid from his war patrons. If anybody think that this bloodthirsty monster had no knowledge how to get that aid is a fool. He had enough access and knowledge but did not want to save the subjects lives and introduce any sort of civilization into the newly incorporated regions. To simply understand Minilik’s diplomatic ability and access to European countries it is enough to look at the next example. He amassed the next bulk of guns and ammunitions between 1968 and 1990 from four European countries with which he massacred millions of unarmed Oromos and the Southern Peoples. During Minilik’s reign a productive forces- all men capable of producing- from the north ( Habasha country) were forced to wage colonization war on the South (oromi’a, Sidama, wolayita,Somali, etc,) productive forces who resisted colonization. This process of war took more than two decades and during which all sort of production and progress was impeded. Therefore it is not a matter of wonder if famine and plague hit the people, because it was a man made famine and plague. Take the case of Tewodros, he didn’t force the European missionary to produce improved farming tools. Instead he forced them to produce not even simple guns, but cannons. This shows that his appetite for mass destruction was overwhelming and clarified that Habasha rulers were and still are obsessed not with development and growth but with killing neighboring people to colonize and loot their wealth. This famine is inherent in this part of the world because the regimes were busy at war and looting the resource of the people rather than development and progress. Out of thousands of Tewodros’s barbaric acts, to mention one of his anti-production deeds “Tewodros went to Karoda village. Karoda is known with its grain production and specially, in grape production. It was said that in Gonder one barrel of wine was sold with one bar of salt. Europeans said Karod wine was superior to European wine. He (Tewodros) ordered that grapes to be uprooted. Everybody who heard the King’s order uprooted his grapes. After that there was no wine in Ethiopia. Haleka Weldemariam wrote that, “Tewodros upon his arrival at Karoda ordered the people to be gathered at one place, 1700 people including children were gathered together. He packed all people in the houses at a maximum capacity and burnt them alive.” (Yewugena dirsetochina ye tarik Ewunetoch, by Tabor Wami, p416-417). Tewodros’s advocates try to convince us that he had a big vision for Ethiopia. I don’t understand how, the king who instead of rewarding those productive people at Karoda, burn them alive can be presented as visionary. Tewodros never owned and resides in a palace and never settled in one place. He was called a king who lived in tent. He came to power through war, he waged war on different rival chiefs, brutally punished the people in the localities he found resistance. He committed genocide and brutal acts like mutilation of hands and legs, burning alive in mass, slain etc. wherever he set foot on. What makes Tewodros special is, even though he did the same crime on neighboring Wallo Oromos, his victims include Abisinyans. This does not mean that he had no hatred for other nations like Oromos, he had extreme rancor for Oromos and had a long intention to invade and evict them from their land. This evil intention was expressed in his letter written to Queen Victoria of England to ask for armaments to wipe out these Oromos whom he mentioned “pagans who occupied his father’s land”. When we come to the modern era we find the Haile Selassie aristocratic and keliptocratic monarchy rule which the remnants of Naftenyas consider as nirvana. In actual fact it was as hell as the present time for the people who were expropriated their land and reduced to gabar, chisagna, slave, etc. This regime divided all the colonized peoples’ land among his invading army leaders who were changed to feudal land lords. This system of land ownership discouraged the farmers to produce in full capacity and famine was the day to day life style of the people. We can mention what famine meant to these rulers. “Heart-wrenching images of starving children are a surefire way to stimulate aid donations. Since the technology to store grain has been known since the time of the pharaohs, we cannot help but wonder why the children of North Africa remain vulnerable to famine. A possible explanation lies in the observations of Ryszard Kapuscinski. Writing about the court of the Ethiopian emperor Haile Selassie, Kapuscinski describes its response to efforts by aid agencies to assist millions of Ethiopians affected by drought and famine in 1972. What I mentioned above is to refresh your memory a little bit. Even though corruption and kleptocracy were not started by Habasha rulers they were the first to introduce it to Africa. H/ Silassie started hording billions of Dollars in Swiss banks long before any African country got its independence. Therefore he is considered to be the first kleptocrat, the father and teacher of corruption in Africa. We are still in the same vicious circle of corruption and kleptocratic rule. Instead of avoiding the barbaric acts of their fathers and forefathers todays Fascist rulers modernized and continued the same barbaric acts. Instead of burning alive, mutilation of hands and legs in public like Tewdros and Minilik, and instead of killing and throwing the dead body of their victims on the streets of cities like the military junta, today’s rulers do it behind doors, in known and un known detention camps, and prison centers like H/ Silassie deed. A hidden war is waged on the people in all colonized regions too. Therefore it is not a matter of wander if peoples of this part of the world are starved in millions year after year. All Monarchs, Communist Military Junta leaders and The Fascist TPLF Dictators are on the same set of war against the colonized people, corruption and looting. In all of the mentioned criminal regimes government revenue was and is spent on bribing supporters and left open for corruption and on buying the loyalty of a few key cronies at the expense of general welfare. Yet these corrupt dictators make sure that the people cannot coordinate, rebel, and take control of the state and endeavor to keep those outside of their coalition poor, ignorant, and unorganized. That is what TPLF fascists are doing today. Instead of mitigating poverty and hunger they loot all tax payers money, borrowed and aid money to reward their supportrs and buy weapons with the extra money to wage war on the colonized peoples like Oromo, sidama ,Ogadeenia, afar etc. who ask for their freedom. What is heart breaking most is on the very day they preached the self- sufficiency of the country in food supply and the idea was praised by US President, the International Agencies and medias started disclosing at least 4.5 million people are starved in a “Praised Ethiopia for its double digit economic growth”. These Fascists behave like shy to tell the truth to the people of the country they rule about the famine looming on the people. On another hand they are courageous enough to exaggerate the damage to the donor countries to attract more relief funds. Once the aid fund is secured, it is simple for them to divert it into their private accounts, rather than being steered towards famine mitigation. Letting people die is good governance for them. This is the behavior of corrupt rulers. I want to quote “We started this chapter with an account of Hail Silassie’s shakedown of donors. By now it should be clear that this practice is all too common, and reflects the logic of privately given aid. When private donors provide aid, governments must either strike deals with them so that the government gets its cut-that, after all, is the value of aid to a small coalition regime-or, in the absence of such deals, they must shakedown well-intentioned private donors. Either way, the government must get its piece of the action or it will make it impossible for donors to deliver assistance.”(The Dictator’s Handbook, p.186) This prevalence of master thieves among world leaders is shocking. As the writer of this book clearly stated this practice is all too common to day and the corrupt TPLF leaders are an expert in channeling aid money to their foreign bank accounts. Their so called Civil Society’s Law was declared only to shakedown donors like their grandfather did half a century ago. So this process is a vicious circle which does not go away by itself. Nothing can stop this peril except liberating ourselves from the grip of these keliptocratic fascist dictators with our own struggle and sacrifice and build democratic and accountable governance. Posted by OromianEconomist in Famine in Ethiopia, Food Production. One of the most common misconceptions about the challenges in food security (the term used to describe getting people consistent access to the food they need), is that it exists due to a lack of food. That’s just not true. In fact, the world already produces more than one and a half times enough food to feed everyone on the planet. So what gives? First, it’s important to understand that being food insecure isn’t just about lacking enough food to put on the table. It’s also about lacking access to diverse nutrient-dense foods like fresh produce. In this way, some people who are obese can actually be considered food insecure if the food they consume isn’t nutritious. Here’s a rundown of the factors leading to food insecurity. 1) The most obvious is that people can’t afford nutritious food. While it’s up to governments to ensure that healthy, affordable food is available at all times, addressing the root causes of inequality will also go a long way towards empowering people to earn higher incomes. 2) Another barrier that stands in the way of food security is a lack of access. Around the world, people can find themselves in one of two dangerous situations: they live in areas so remote that there are limited options nearby, or they live in food deserts (urban neighborhoods or towns that lack ready access to fresh, healthy, and affordable food.) When the latter is true, families end up buying their food from convenience stores (think 7-11) and fast food chains- both which are filled with unhealthy, processed food. 3) Distribution can be just as much of a challenge when you consider all of the things that can go wrong between food leaving its point of production to its point of sale. In the developing world, many of the roads are poorly maintained and there are few high-quality railways to transport goods to a centralized market. Imagine a one-lane dirt road in the middle of a heavy rainstorm. If a truck is delayed and it lacks adequate temperature control, much of the food could go bad before arriving at its destination. That’s a problem for the farmer, and the consumer. 4) As the planet has grown warmer and prone to more extreme weather events, small-scale farmers are paying the price. Droughts and heavy rainfall affect crop yields, and poor farmers can’t bounce back the same way that large agribusiness can. This affects consumers as well, who end up paying more when food becomes scarce. To protect farmers and consumers, world leaders and governments need to work with local farmers to fix the existing systems that leave small-scale farmers vulnerable. 5) Conflict and political instability have the power to wreak havoc on already fragile systems by interrupting distribution and isolating people. Food aid can help, but it must be done the right way- with consideration of what the local people eat, and with the intention of minimizing dependence on foreign aid. 6) Lastly, too many small-scale farmers aren’t empowered to reach their full potential– especially women. In many countries, laws exist that prevent women from inheriting the land they’ve spent their entire lives working on when their fathers or husbands pass. Similarly, women are often prevented from purchasing land, and prevented from selling their food at the market. By empowering women, more families will have the opportunity to thrive, especially since women invest more of their income in their families than men. Furthermore, men and women alike need access to education to learn the most effective ways to grow and sell food, and they need the resources to implement the strategies they’ve learned. Without these changes, small-scale farmers are missing out on a tremendous opportunity to not only lift their families out of poverty but also to provide their communities with delicious, healthy food. While it might feel daunting to consider how many barriers stand in the way of food security, the silver lining is that it isn’t some mystery. Experts understand what needs to be done to feed the world’s people- it’s just a matter of building support and implementing proven strategies. 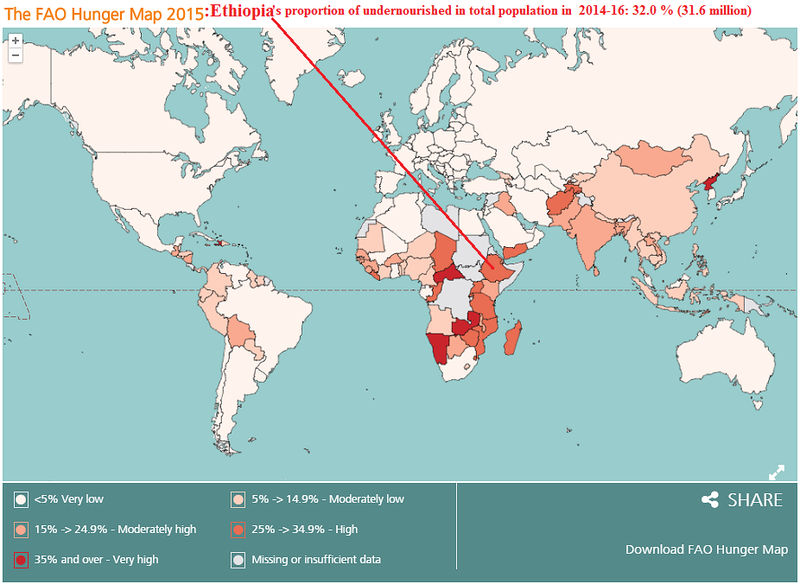 Ethiopia: Proportion of undernourished in total population in 2014-16: 32.0 %. Twenty years ago one Ethiopian Diaspora in Washington asked the late Prime minister Meles Zenawi what his vision for the country was. A rather polite and amiable Meles outlined his vision in a very human centered way. He said he hopes that in ten years every Ethiopian will have enough to eat three times a day and after 20 years Ethiopians will not only have enough food but they will also have the luxury of choosing what they eat. Here we are now. Three years have passed since Meles died in office after 21 years in power. Once again Ethiopia’s food crisis is topping the headline. As seasonal rain fails in Eastern and Southern parts of the country, famine is threatening millions of Ethiopians. The UN estimates over 10 million are in need of emergency food aid. Why is famine and hunger so common in Ethiopia? Many experts relate Ethiopia’s cyclical famine with the country’s dependence on Rainfed smallholder agriculture, drought, rapid population growth or agricultural market dysfunctions. Although these factors do have significant role in the matter, they tend to hide the critical cause of hunger in the country – lack of rights and accountable government. Nobel Prize winner and economist Amartya Sen has extensively analyzed the relationship between democracy and famine in his book Development as Freedom. Sen argues democracies don’t have famines, only authoritarian systems do. Famine tend to happen in places where the victims are oppressed by dictators. A historical investigation of famine also identified 30 major famines during the 20th century. All happened in countries led by autocratic rule or that were under armed conflict, four being in Ethiopia. Why does autocracy lead to famine? The most fundamental reason is that autocrats often don’t care enough about the population to prevent famine. Autocrats maintain power through force, not popular approval. This argument has been proven true in the case of Ethiopia. During 1983-1985 the worst famine in the country’s history had led to more than 400,000 deaths. Extensive investigation by Alexander De Waal in his book Evil Days: Thirty Years of War and Famine in Ethiopia has found “more than half this mortality can be attributed to human rights abuses that caused the famine to come earlier, strike harder, and extend further than would otherwise have been the case.” The military government is not only spent between $100 and $200 million to celebrate the tenth anniversary of the revolution while millions were starving, Mengistu’s regime also attempted to impose customs duties on aid shipments. Similarly during the 1973-1974 Wollo famine, attempts to hide the reality of the situation by the Imperial Feudal System caused 300,000 deaths. 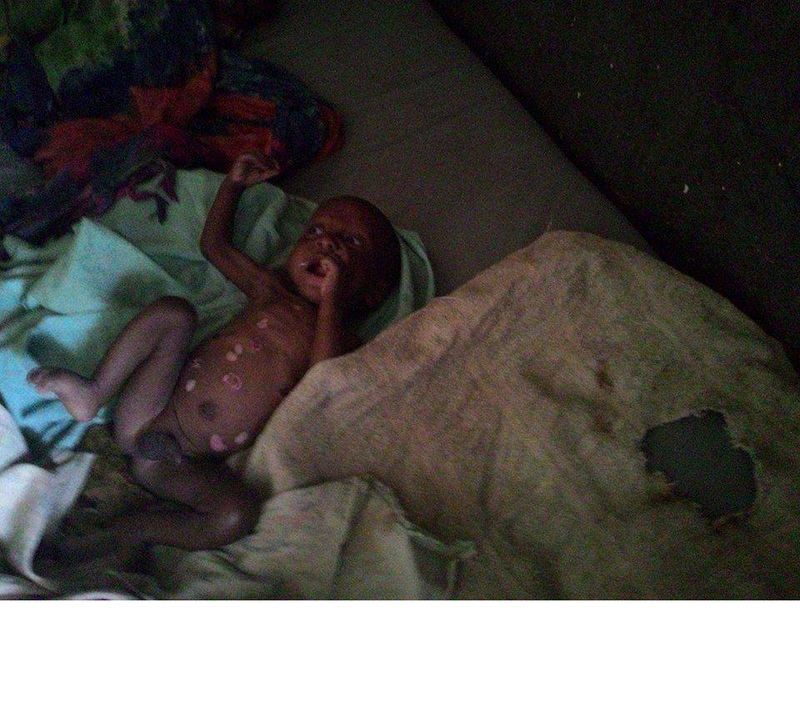 This particular famine was not a problem of food shortage in the country but lack of ability to access food. The Ethiopian Ministry of Agriculture Report of 1972 stated that output for 1972-1973 was only 7% lower than the previous year. Also,food price in Wollo were no higher-often substantially lower-than elsewhere in the country. The problem was the poor just couldn’t afford to buy. Meanwhile, Emperor Haile Selassie spend some $35 million to celebrate his eightieth birthday in 1973. 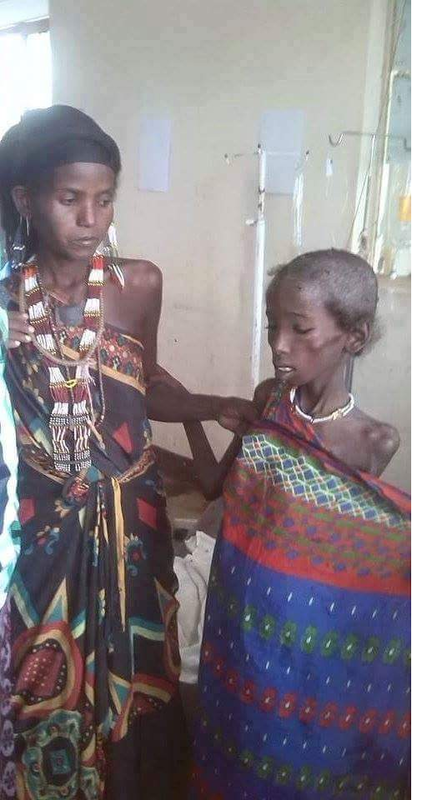 Unfortunately the trend of autocratic-led hunger has not changed under the current government either, if anything Meles’s regime took it to the next level. Again 2010 in a report titled Development without Freedom: How Aid Underwrites Repression in Ethiopia, Human Right Watch extensively documented how the EPRDF is using development aid to suppress political dissent by conditioning access to essential safety net programs on support for the ruling party. Today, once again the danger of another catastrophic famine is looming large on the horizon. Ongoing drought worsened by the El Niño global weather phenomenon has already caused deaths of many cattle and have put as many as 14 million people at risk. After denying the problem for weeks; the government finally admitted to it but only to claim that it has enough food stock to tackle the problem. However, journalists on the ground have reported the government’s grain reserve has run out long ago. According to Barrie Came, WFP representative, the food supply by the UN is also not enough to curb the problem. The government also argues the country has already realized food security at a national level, that is to say we have enough food in the country to feed everyone. The inherent flaw in this argument is that the presence of food in the country doesn’t necessarily mean those affected by drought will have access to it. As it was the case during the 1973 Wollo famine, when a crop fails it not only affects the food supply, it also destroys the employment and livelihood of farmers, denying them the ability to buy food from the market. Reports have also shown that the government was informed of the risk of seasonal rain failure forecast as early as two months ago but it chose to keep it to itself. Had the government shared the information with the media and local governments to inform pastoralists to move their cattle near rivers or highlands, much of the animal loss would have been avoided and relief supports would have been delivered on time. Why is the Ethiopia government acting so irresponsibly? The answer is simple – because there is no incentive for the government to work hard to avert famine. Amartya Sen argument related to absence of political incentives generated by election, multiparty politics and investigative journalism is also true in the case of Ethiopia. The EPRDF led government has successfully wiped out all groups that might pose any form of threat to its power. Fresh from its 100% “election” victory, with very fragmented opposition parties, no civil society and no scope for uncensored public criticism, Hailemariam’s regime doesn’t have to suffer the political consequences of its failure to prevent famine. If there were a democratic system to keep the government accountable, the state’s response would have been much different. For instance, Botswana, like Ethiopia, is prone to drought but a democracy since its independence in 1966, Botswana never had a famine. Botswana’s democratic government immediately deploys relief efforts during every drought, and even improves them from one drought to the next. Had the government in Botswana failed to undertake timely action, there would have been severe criticism and pressure from the opposition and maybe even bigger political cost in future elections. 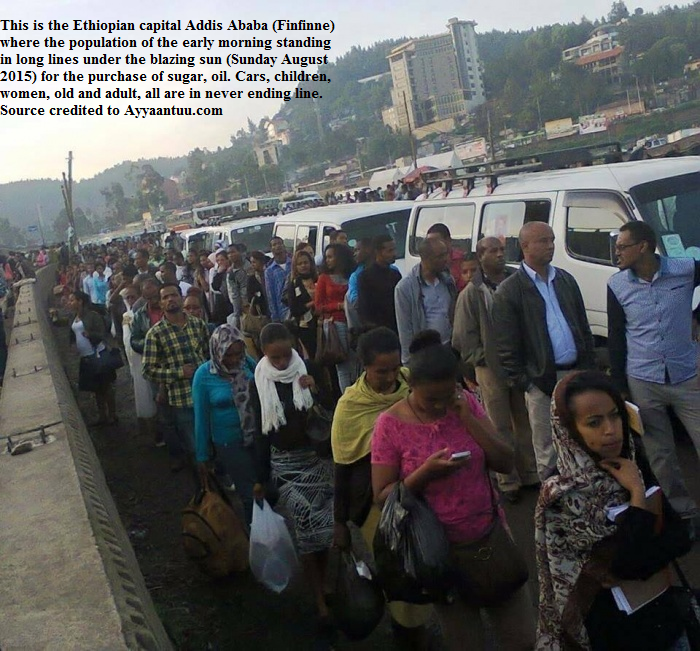 In contrast, the Ethiopian governments did not have to worry with those prospects. If aid organizations comprehensively and immediately deploy humanitarian assistance, the current crisis could be impelled with minimal damage. However, the argument that famine in Ethiopia is caused by drought doesn’t hold water anymore. Unless the problem is addressed from its roots, another famine is just a matter of time. For Ethiopia to truly achieve food security and avoid any dangers of famine in the future, nothing but building a democratic, transparent and accountable system is the solution. Posted by OromianEconomist in Economics, Famine in Ethiopia. In the midst of fastest growth hype and official statistical lies, Ethiopia has been plagued by high rocketed prices for basic goods, intensive and chronic shortages in all sectors of economy. 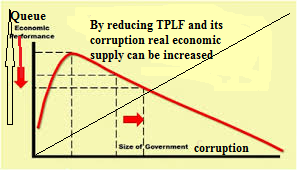 This is the situation of TPLF ( fascist government and monopoly) controlled economy experiencing declining production (supply deficit) relative to citizens demand for basic necessities. In dealing with bureaucratic corruption that tinkers with distribution, citizens are experiencing long queue (disutility) in cities for basic goods for which very limited supply is available. They may be approved or disapproved to get access to the purchase by TPLF local cadres decisions. It has been reported that Ethiopia’s rural areas are in catastrophic famine. Widespread shortages, spiraling inflation and famine are fueling humanitarian crisis. Famine in Ethiopia: The act of man or Nature? What are really the causes? Why? What went/goes wrong? What are the main reasons for continued famine in Ethiopia? Is it an act of nature, an act of man or God? Who is to be blamed? A combination of long period political and economic instability has produced chronic famine in Ethiopia. We could recall the 1972/1973 and 1984/1985 starvation episodes that devoured hundred thousands of lives. Even this time millions of people are starved to death. It is taken for granted that millions who are starving or threatened with starvation in Ethiopia to day are the victims of a drought caused by an unpredictable and unpreventable reduction of rainfall or natural disaster. In other words, drought or decrease in the annual rain fall is offered as an explanation for famine in Ethiopia. In reality, however, the famine we are witnessing in Ethiopia is not due exclusively drought or natural catastrophe as the Tigray based Ethiopian minority regime and some “researchers” would like us to believe. It is a good example of an inevitable result of bad government polices. Drought, climate variation and other natural calamities (disasters) occur not only in Ethiopia, but in any part of the world. However, drought does not necessarily result in famine. Famine can be avoided if the government takes its responsibility. Therefore, there are good reasons to consider political instability and lack of democratic governance as significant factors. Famine should be understood more broadly as a symptom of some thing the solution of which strongly demands a deep understanding of political and environmental systems of the country. In other words famine vulnerability has to be sought in human and natural elements. Let me try to elaborate this with a very simple formula. Environmental degradation mainly as a result of bad managementPolitical crises are thus the centre of the famine problem. When there is politically induced insecurity, instability, repression, people will be affected by famine. When there is lack of freedom of association and lack of voice, there will follow restrictions on economic opportunities. Human right violations cause persecution, suffering and forced displacement of people. Lack of democracy and peace are major obstacles which have the main effect on famine in Ethiopia. Under authoritarian rule, it is always difficult to fight famine and poverty. The TPLF minority government which is obviously on turmoil seems determined to conduct its campaign under the so called democracy which may as well target national groups to fight what it calls narrow nationalism and separatism. It has been observed that famine do not occur in democratic countries with a relatively free press and active opposition parties because people have established mechanisms to compel governments to address their pressing needs. Moreover, famine in general and starvation in particular happen because of the failure of governments. Democratic governments are bound by social and political contract to respond to the need of their citizen. They know that failure of the contract on their part brings an end to their stay in power. Elections and the possibility of public criticism make the penalty of famine affect the rulers as well – not the starving people. Therefore, the main roots of the famine crises in Ethiopia are related to political instability and economic uncertainties. Changes in these features are required on a real urgent base. Misplaced political priorities can also easily lead to famine. For example, if high emphasis is given to the agricultural development sector and annual imputes into the rural sector are increased, Ethiopia can feed itself with out any problem. 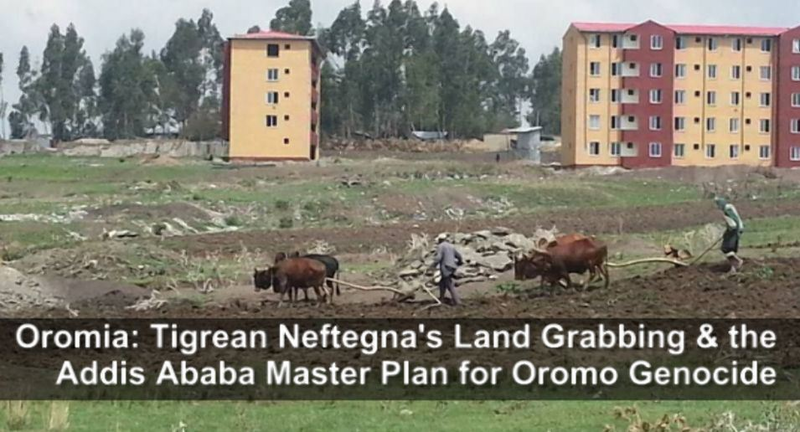 Serious studies indicate that only 20% of Ethiopia’s 65% suitable land is used for cultivation. Drought, pest and disease are good examples of natural interference. Pest and disease are not reported to cause the famine in Ethiopia (at least the government did not claim). Drought by itself is the result of deforestation, soil erosion and biological soil deterioration. Drought triggers the famine crises, but does not cause it. 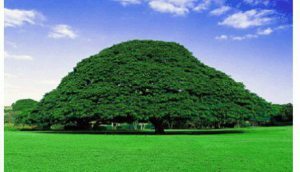 It is to be recalled that calamitous forest fires raged across large areas of the country especially in Oromia region and destructed a vast area of forest. Such type of destruction of forests leads to lowering of soil moisture and suppress rail fall because much of the rain comes from water evaporated off forests/vegetations. As the forest is destroyed, it holds less water and produces a drier local climate or drought. Therefore destroying forest reduces not only the amount of rain but also the moisture to evaporate or run off damaged soils. The problem is that the soil’s water-retaining capacity has been reduced by human interference with nature. The most important thing is to understand that drought is not the direct cause of famine. Assume that drought in Ethiopia has resulted in low levels of production. Does this lead us to conclude that it results in famine? No! People do not starve in a drought related famine simply because there is low production or no food. Famine is influenced by working entire economy. It is very important to take an adequate view of the politico-economic processes that lead to famine in Ethiopia which continue to kill millions of people. 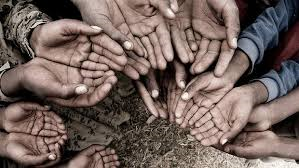 What determines whether a person is starving is its food entitlement that is the amount of food he or she can obtain, own and use, not just the total availability of food in the country or region. I can give Ethiopia as an example. 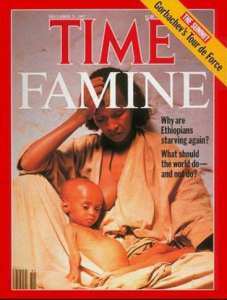 Throughout the famine 1984-1985, Ethiopia was a net exporter of food, Ethiopia still export food. Given the deep-seated interdependences that influence economic and political deprivations and famine, a narrowly drought centred view would defeat the purpose finding practical ways of fighting famine in Ethiopia. Political-economic-peace-democracy and famine interdependences have to be adequately seized for the ultimate elimination of famine and starvation in Ethiopia. Catastrophe political and human crises are taking place in Ethiopia. Millions people are on the edge of death, Children, young and old are dying every day. (OMN:Oduu Hagayya 23, 2015) Godina Harargee Lixaa, aanaa Daaroo Labuutti, sababa hanqina roobaatiin ummata beelaaf saaxilameef gargaarsi muraasni dhaabbilee gargaarsaa mitmootummaatiin kennamu, ummata beelaan dararamu otoo hindhaqqabiin qaamolee bulchitoota mootummaa Itoophiyaatiin jumlaadhaan gurgurtaarratti akka argamuufi ummatichi daran beelaan lubbuun galaafatamaa akka jiru jiraattonni Oromiyaa Midiyaa Networkitti himan. Hanqina roobaa mul’ateen ummata Oromoo balaa beelaatiin rakkachaa jiruuf gargaarsi mootummaa Itoophiyaatiin godhamu dhabamee wayita jiru yeroo kanatti, gargaarsa muraasa dhaabbileen mit-mootummaa, ummata beela’e afaan jiisuuf ergan qaamoleen mootummaa gurgurtaarra oolchanii dantaa dhuunfaatiif oolchaa akka jiran himame. Godina Harargee Lixaatti jiraataan aanaa Daaroo Labuu tokko OMNitti akka himanitti, ummanni aanichaa beela’e waan nyaatu dhabee wayita du’aan galaafatamaa jiruufi qe’eesaarraa godaanuuf dirqamaa jiru kanatti, qaamoleen mootummaa Itoophiyaa midhaan gargaarsaa dhaabbilee mitmootummaarraa argame, qoonqoo namoota beelaaf saaxilamaniirraa fudhatanii gurgurachaa akka jiran dubbatanii, gara jabummaasaanii hadheeffatanii ibsan. Midhaan nyaataa dhaabbileen gargaarsaa kan akka ‘Food program’ kennan kunniin, bulchitooonni aanaa Daaroo Labuu hojjattoota qonnaa waliin raabsuuf itti gaafatamummaa fudhataniillee, ummata jalaa gurgurachuuf waliigaluudhaan hojjataa waajjira qonnaa tokkoo kan Abdulhakiim jedhamutti dhimmi bahuudhaan jumlaan daldaltoota Magaalaa Machaaraatti gurgursiisaa akka turan kan himan namni kun, dhumarratti icciitiin jalaa bahuusaatiin fakkeessaaf hojjaticha yeroo muraasaaf to’annaa jala oolchanii murtii tokko malee akka gadhiisan saaxilan. Dabballoonni mootummaa, bulchitoonni sadarkaa aanaafi gandaa jiran, akkasumas hojjattoonni kaabinee harka keessaa waan qabaniif dhimmichi xiyyeeffannaa akka hinarganneef yaalii gochaa akka turan namni kun dubbatanii, ummatichi afaanii baasee akka hindubbanneefi ragaa hinbaaneef sodaachisaafi hidhaa akka turanillee himaniiru. Balaan beelaa, aanichatti daran hammaatee akka jiruufi guyyoota afur dura ganda tokko keessatti qofa guyyaa tokkotti haati ijoollee sadii waliin lubbuun galaafatamuusaanillee dubbataniiru. Gargaarsa mootummaa dhabame ilaalchisee, mootummaan ummaticha quba akka hinqabaanne namni kun mul’isanii, bulchitoonni gandaafi aanaa rakkina ummataa mul’achaa jiruuf furmaata kennuuf daran akka hindhiphanneefi ummataaf hojjachaa akka hinjirre ifa godhaniiru. Balaa beelaa yeroo kanatti ummanni ittiin dararamaa jiru ilaalchisee, ummanni Oromoo naannawa Harargee Bahaafi Dhiyaa, Arsiifi Baalee, akkasumas Karrayyuu beelaaf saaxilame waan nyaatu dhabee qe’eesaarraa godaanaa jiraachuusaa maddiittii, beelaydoonnisaa jalaa dhumusaaniifi lubbuudhaanillee galaafatamaa akka jiru gabaasawwan Oromiyaa Midiyaa Networki armaan duraatiin isiniif dhiheessuun keenya ni yaadatama. Why is Eritrea Thriving While Ethiopia is Starving? (Tesfa News) — It was with dismay that we read today alarming reports that warn of catastrophicfood insufficiency in Ethiopia. The grim picture shows that Ethiopia will need an extra $230 million from donors to secure aid for4.5 million people this year alone. How come this is possible must be a very big mystery as Ethiopia is considered to be one of the fastest growing economies of Africa. To be fair to Ethiopia, the nation has been badly hit by failed seasonal rains. On the other hand, the whole region is suffering from the same phenomenon as weather conditions and other such ‘Acts of God’ neither know nor distinguish between nations; weather neither recognizes nor respects territorial boundaries. Is it then not about time that the question gets raised why Ethiopia is the only country in the region which is too busy spending its resources on building up military might to terrorize neighbours, occupy sovereign foreign territories and be a general menace both at home and around the neighbourhood while her own people are constantly faced by drought, hunger and famine. It is exactly thirty years and twenty-five days ago since the artist Bob Geldoff organized the Live Aid concert which was watched by an estimated 1.5 billion worldwide, featuring 16 hours of live music and raising about £50 million on the day, and about £150 million in the decades since the event from merchandise sales. The event which was held live and simultaneously at Wembley Stadium in London and JFK Stadium in Philadelphia on July 13, 1985 featured some of the biggest and most prominent artists of the day. This big charity event was to give aid to the starving millions of Africa as result of failing rains and droughts. Ethiopia was one of the major targets and beneficiary of that heroic effort. At that time, Eritrea was illegally occupied by Ethiopia and was frenetically fighting for independence. Today, three decades later, Eritrea is a thriving independent nation. Eritrea is as badly hit by failing seasonal rains as Ethiopia, but these adverse effects of ill planning, ill management and poor governance making Ethiopia to go on begging spree year after year are a thing Eritrea left behind her the moment she won her independence. 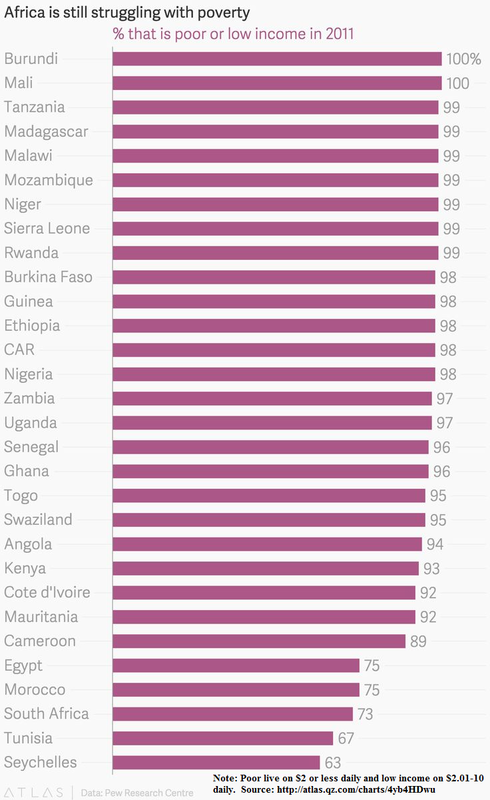 So, what is Eritrea doing right and Ethiopia doing very wrong? President Obama has partly answered that question when he once said that what Africa needed was strong institutions and not strong men. Do the Ethiopian leaders not read the holy scriptures? Even pharaoh had the common sense to plan when he dreamt about seven lean cattle devoured seven fat ones. Joseph deciphered the dream as a need to gather and save food during seven years of bounty to cater for seven years of drought and famine. The nation of Egypt thrived and survived those seven lean years without having to beg. Even ants save for a rainy day! Eritrea is constantly yearning and working for sustainable peace between her and her giant neighbour. Ethiopia would have been more sensible to maintain a more peaceful and amicable co-existence with Eritrea and cooperate in the many sectors in which Eritrea has a proven track record of success such as agriculture despite failing seasonal rains.